So, I recently became a father. Among the myriad of things on my mind these days, one of them is oddly what kind of TV or online shows will my daughter be watching while growing up? As a kid, there wasn’t much selection. There were the three major networks and a few syndicated channels in the UHF bands. Of course there were no dedicated Disney channels, cartoon channels or general kids channels. The best variety was available in those brief hours Saturday morning of back-to-back cartoons and super hero live action shows was a weekly treasure. I remember going to Hawaii with my family one Summer and through the whole trip I was wondering if we’d make it back in time for the Fall Saturday morning cartoon premiers. There were prime time Fall lineup preview shows that almost made me salivate at the thought of new adventures for old favorites and new characters to come to know. These days, with so many choices, I wonder if children develop a real bond and fondness for what they’re watching or is it simply something to pass the time between toy commercials? At Comic-Con this year, a lot of the Saturday morning joy came flooding back when I attended the Filmation panel. Filmation was the alternative to Disney and WB cartoons through the 70s and early 80s. The animation was relatively cheap and employed frequent stock footage but the action was good and there was a clear moral message in many of the shows and episodes. They had a wide variety of original and licensed IP including Batman, Tarzan, Star Trek, He-Man and She-Ra. What felt really unique for the time was Filmation’s venture beyond animation to create original live-action shows. 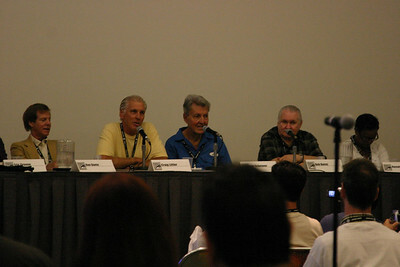 The Comic-Con Filmation panel gathered together some original cast members from two of the shows, Jason of Star Command and The Secret of Isis, including character actor and recently revitalized horror movie star Sig Haig. Former Filmation head Lou Scheimer was also present. These Filmation shows were surprisingly big in ambition. Some of the earlier shows like Ark II dealt with scientists trying to rebuild the Earth after environmental ruin. Space Academy and its sequel Jason of Star Command dealt with the growing up in space surrounded by aliens and later more direct evil that needed to be combatted. The pairing of Shazam and The Secrets of Isis provided live action super heroes to the line up. I remember them having pretty decent production values, at least compared with their closest relatives from Krofft like Electra-Woman and Dyna-Girl or Bigfoot and Wildboy. You can compare for yourself at 70s Live Action Kid Vid. The guests at the panel all seemed to have some fond and endearing memories of their work, even if it was just a year or two of their lives. The session went quickly with each panelist telling a quick story and where they are now followed by a few questions from thirty-somethings like me. Now, how do they hold up today? I’ve not seen most of the shows for a long time. I caught an episode of Shazam last year. My wife was horrified at how bad it was. It was an episode where kids play in a power station and Captain Marvel needs to save them. It was pretty low budget with the powerful hero needing a step ladder to reach the unconnected transmission lines. I’m scared to think that Space Academy and Isis also didn’t age so gracefully. BCI’s Ink & Paint label have been putting out DVD collections for the past year. Maybe I’ll add it to my NetFlix queue and find out. Previous Previous post: Do people still visit this site?